Uliana Zhivitckaia was born in Ekaterinburg (Ural) and since 2009 she is living in Moscow. She is a student of the Gnessin Moscow Special Music School and her teacher is Olga Ivusheikova, associate professor of the Tchaikovsky Moscow State Conservatory. Uliana is a winner of many international music competitions, such as: International Competition-Festival AZUMI Magic Flutes 2011 (Germany), International Television Competition for Young Musicians “The Nutcracker” in 2012 (Russia), Moscow competition-festival of young performers on woodwind and percussion instruments named Dolzhikov 2014 (Russia) – Grand Prix, Adams Flute Factor 2014 (Netherlands), Virtual Gnessin School Festival GNESINFEST 2014 (Russia), XIII Delphic Games Russia – Gold medal, The Dutch International Flute Competition for conservatory students (Netherlands) and etc. In 2014 Uliana was awarded the title of the best student of the Gnessin Moscow Special Music School. In 2017 she was awarded the 1st Prize, The Overall Winner Prize and the EMCY Prize as well as the Best Performance of Obligatory Composition Prize at the International Radio Competition for Young Musicians “Concertino Praga”. Uliana has an active concert life. She often performs in the concerts of Vladimir Spivakov Foundation. She played in Bulgaria, Italy, France, Spain, Germany, Argentina and in several cities in Russia. She performs in the best halls of Moscow, such as the State Tchaikovsky Concert Hall, the Moscow International House of Music, Rachmaninov, the Small Hall of the Moscow Conservatory and many others. She played several recitals and several times performed as a soloist with orchestras. Uliana’s repertoires are many works of different styles – from baroque to contemporary music. 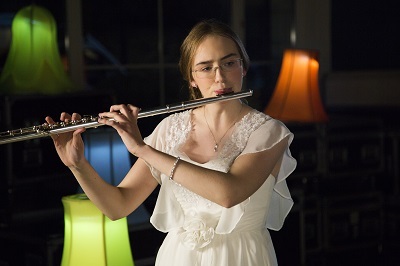 Uliana playing on different instruments: baroque flute, piccolo flute, Irish whistle, harpsichord, piano. Uliana also reads a lot, draws perfectly, explores the world of art and architecture. If you are interested in working with Uliana, please get in touch with the EMCY Office.